Venger's old school gaming blog: Will 6th Edition Have Open Art-Testing? Hmmm... I've been reading a number of fantasy RPG blogs (most of them OSR, probably) about the D&D Next covers. One guy said they were badly cropped. I don't disagree. Another chap liked them overall but couldn't, in all honesty, say that he loved them. Can't blame him. And some dude did THIS! Art is a subjective thing. We won't all nod our heads in unison that one piece of artwork is superior to another. Nevertheless, I think many of us can weigh in on what we like and why, as well as, what we loathe and who should be held responsible and smacked in the head with rotten tomatoes. What I really want to know is this - did anyone even bother approaching Erol Otus?!? I'm sure the gaming ghetto of the internet is buzzing with comments about the subject. So, that begs the question... if the rules were aired out and mulled over for a couple years before being published this summer, why not the artwork? After all, isn't that part of the D&D experience? Don't we care about what's on the outside almost as much as what's within? Sure, a cover is just the surface of a book, the tip of the iceberg... however, the tip is so very, very important. Why leave it up to a handful of professionals? Additionally, the same aesthetic standards of indie RPG companies and publishers do not apply to Hasbro / Wizard of the Coast. We don't expect our product to make millions of dollars. We won't reach an audience of hundreds of thousands. The future of the RPG industry is not in our tiny hands. That brings me to another question - should game design be democratic? Each decision based upon a popularity contest? Is that effective or even healthy? Personally, I think the 5th edition covers are fairly decent. Unfortunately, "fairly decent" doesn't really cut it, does it? I care about roleplaying in general, Dungeons & Dragons in specific. Even if I don't plan on playing Next, I have skin in the game. This is my hobby, my passion, my life. I'm not going to climb a clock tower with a rifle because there aren't enough tentacles or I dislike fire engine red. But let's face it, it matters to me just as the next generation of roleplaying matters to me. I didn't paste the new covers in this blog post because chances are you've already seen them dozens of times and that was probably plenty, unfortunately. So, enjoy some truly amazing RPG artwork: the basic D&D "magenta box" by Erol Otus. In my mind, the greatest RPG cover art ever! It has all the basics - a dragon in a dungeon being attacked by more than one adventurer - magic and martial prowess working together in hopes of acquiring a treasure chest of precious gemstones! Yes, it's a bit dated. 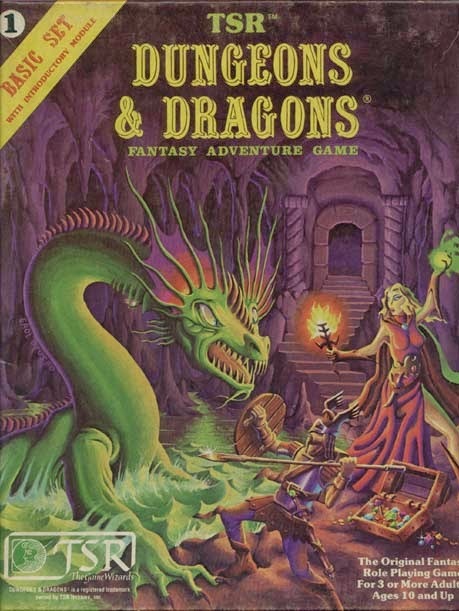 The dragon doesn't inspire the level of fear I'm sure the DM would like, yet, whole captures an otherworldly tone sorely lacking in most RPG art. 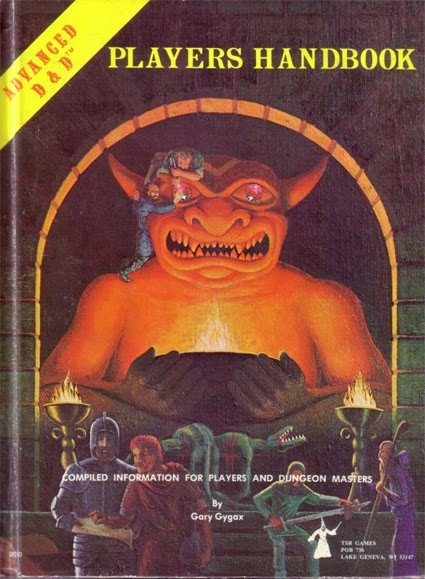 Second place - the AD&D Player's Handbook by David A. Trampier!